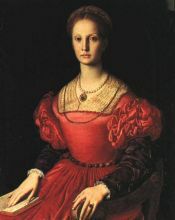 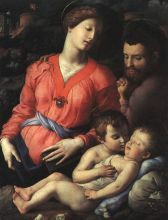 Agnolo di Cosimo (November 17, 1503 – November 23, 1572), usually known as Il Bronzino, or Agnolo Bronzino (mistaken attempts also have been made in the past to assert his name was Agnolo Tori and even Angelo (Agnolo) Allori), was an Italian Mannerist painter from Florence. 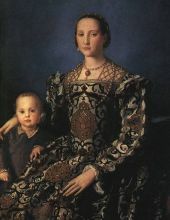 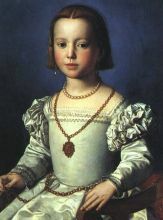 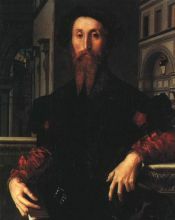 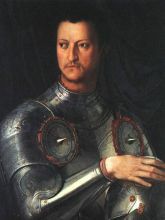 The origin of his nickname, Bronzino is unknown, but could derive from his dark complexion, or from that he gave many of his portrait subjects. 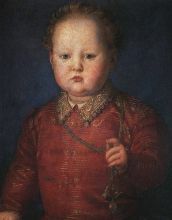 It has been claimed by some that he had dark skin as a symptom of Addison's disease, a condition which affects the adrenal glands and often causes excessive pigmentation of the skin.